If you’ve chosen Granada as a holiday destination, it’s pretty much a given that you’re going to the Alhambra. But once you’ve seen the world-famous palace, what else is there to do? 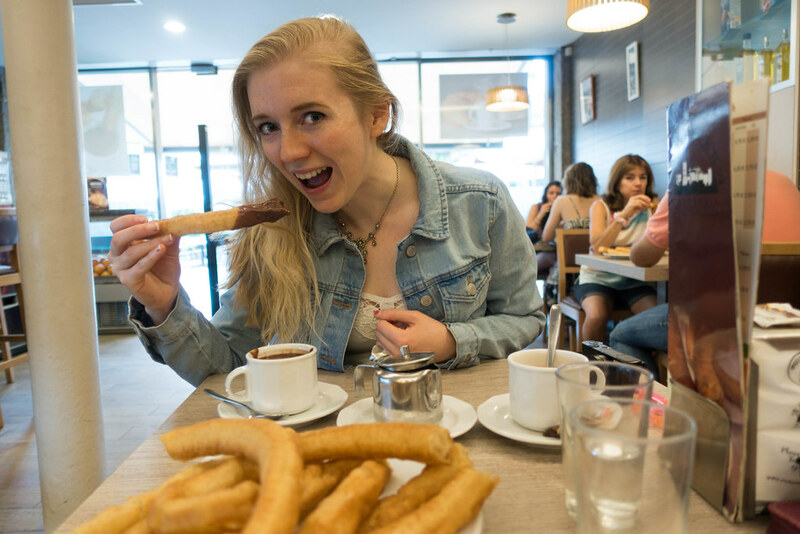 The rest of our time in Granada consisted mostly of impressive religious buildings and delectable food – most notably one of Spain’s most famous exports, churros. 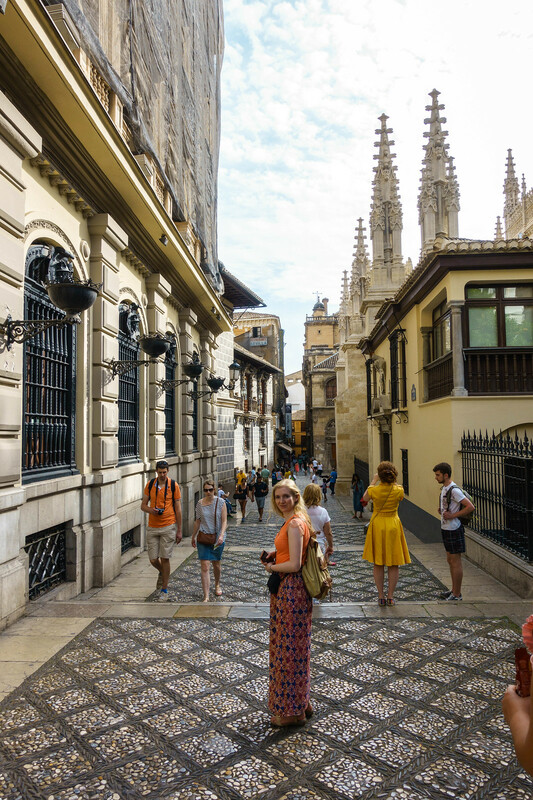 Granada’s popularity with tourists means it’s easy to find a large chain hotel to stay in. However, I always prefer to stay somewhere with history and small hotel Casa de Federico fit the bill perfectly. Based in an old house, the hotel was restored in 2004 in a way that retained the house’s original, traditional features. 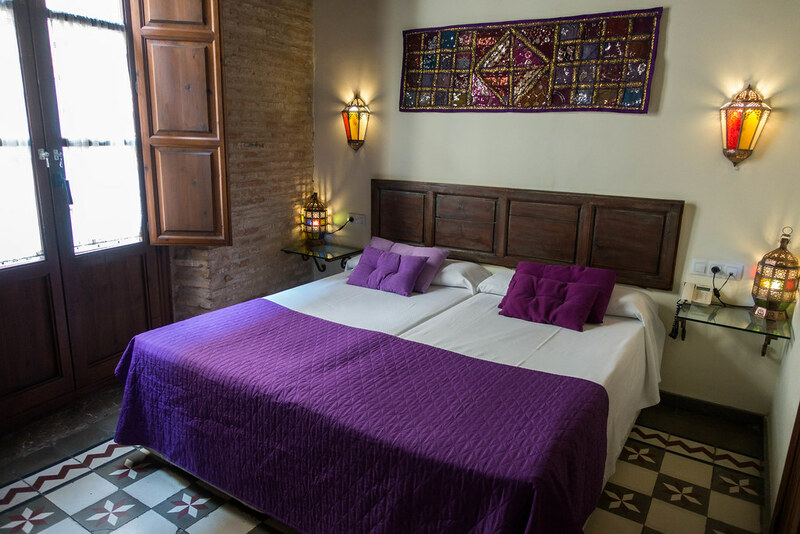 The rooms are simple and rustic, with dark wood shutters and exposed brick walls, but decorated with luxe Arabic touches: jewel-toned textiles, Moroccan lamps, and tiled floors. I felt connected to the city and the Alhambra here, even as we settled in for the night. The staff on reception didn’t always understand English, and our bedroom had no mod-cons such as a TV or kettle. 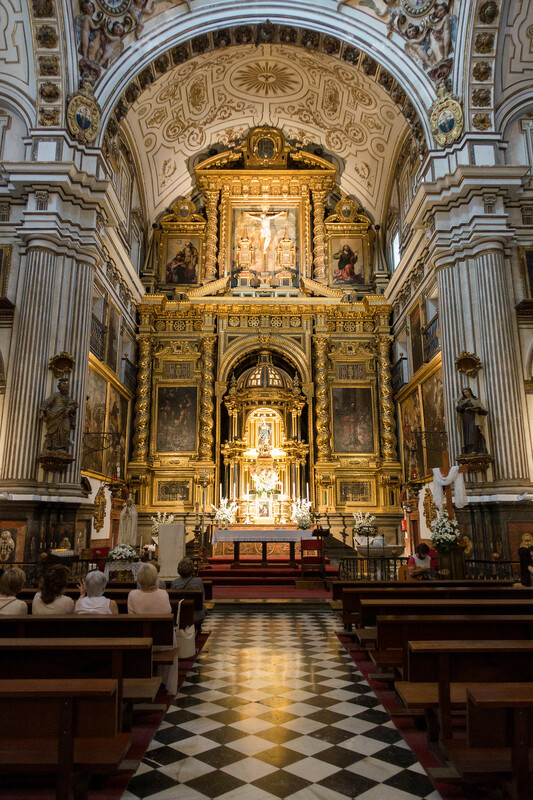 But this hardly mattered when the location was so perfect: a mere minute’s walk from Granada Cathedral. 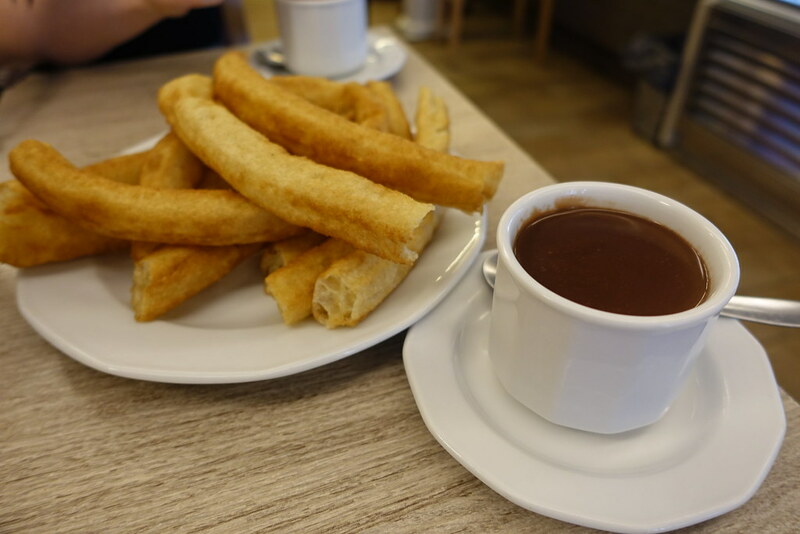 It would be a crime to go to Granada without trying the local delicacy of churros with hot chocolate. It’s essentially an indulgent snack, but with only limited time in the city we decided we’d have them for breakfast. Lucky for us, the Alhambra Churreria was mere minutes from our hotel. Seating ourselves among a mixture of tourists and locals, our eyes were drawn immediately to the giant, seemingly never-ending coils of smooth dough being piped out and fried behind the counter – producing something very different to the small, ridged, doughnut-like sticks sold as churros in the UK. The long reels of fried dough were cut and served to us piled high – fresh, hot and crisp – alongside two steaming mugs of hot chocolate, so sumptuously thick it was better for dipping than drinking. The whole sticky experience was immensely enjoyable, although too sweet and unhealthy to indulge in more than once! 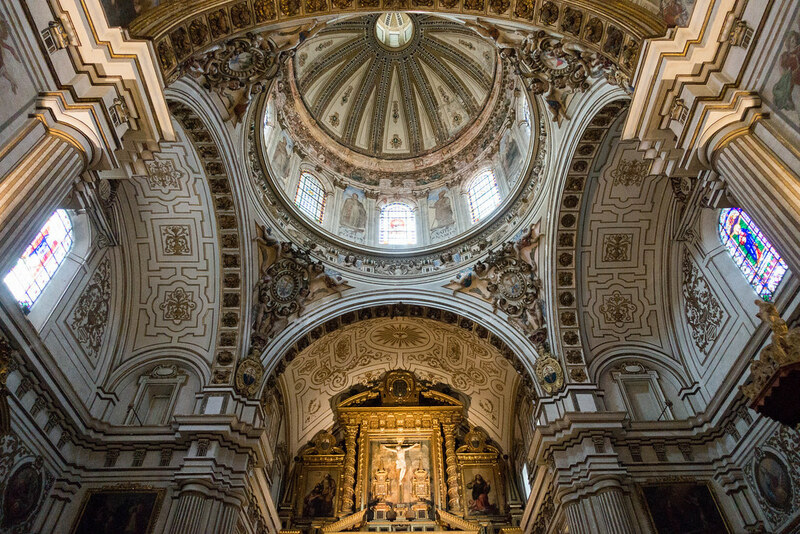 You don’t need to be religious to appreciate the many beautiful churches of Granada. 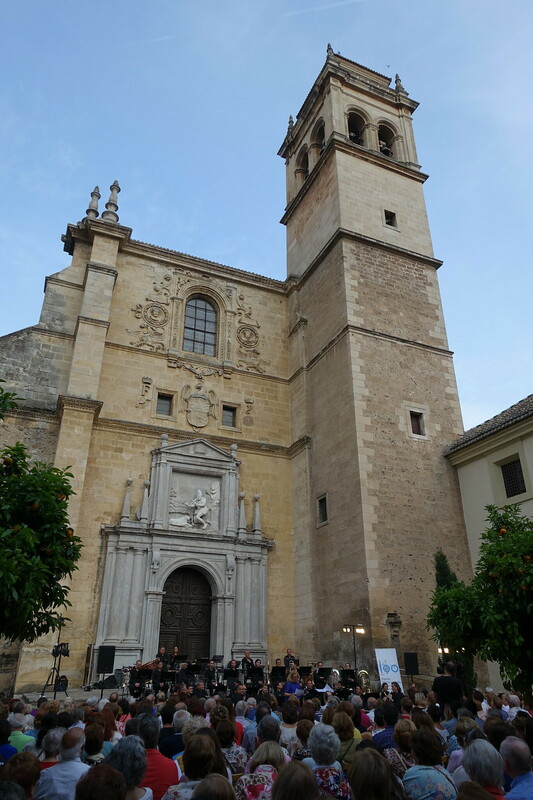 Despite staying beside Granada Cathedral, we never managed to get in, only to admire it from the outside. But there were plenty more similar buildings to see. 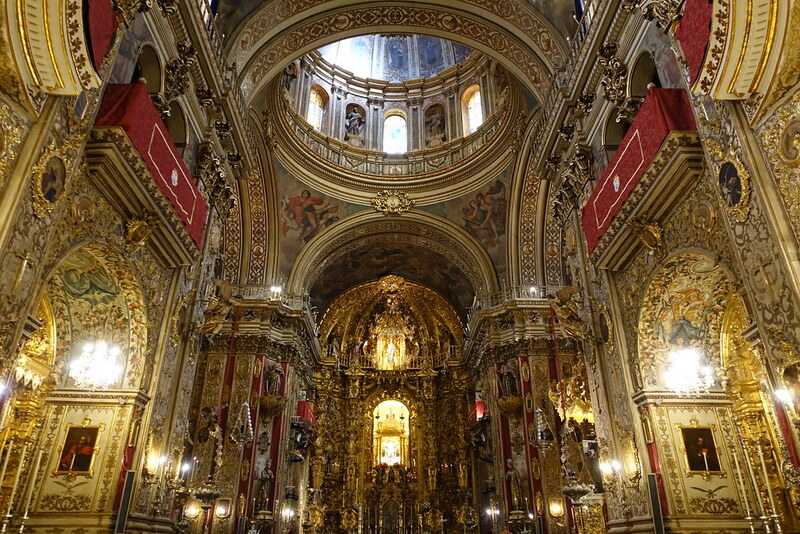 Walking from Granada Cathedral up to the Basilica of San Juan de Dios, we came across the Parroquia de Santos Justo y Pastor and decided to peek in. 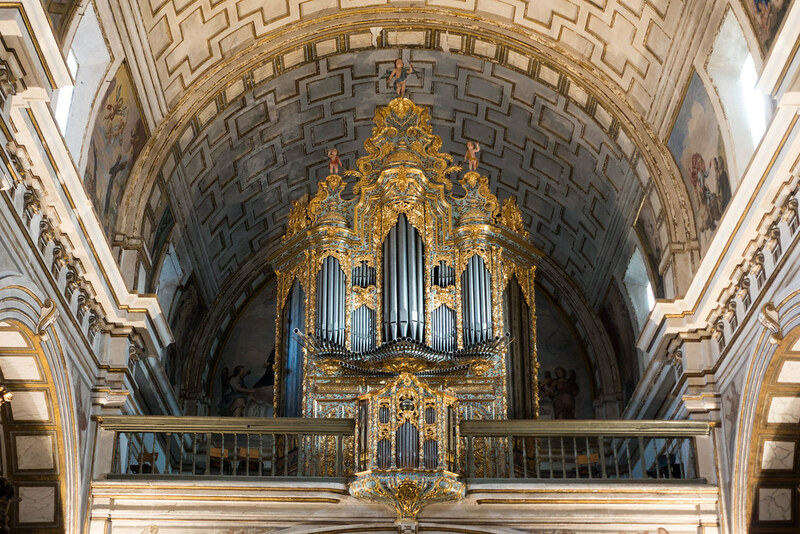 Behind this unassuming building’s doors lies a beautiful white and gold interior, crowned by a magnificent organ. A young man, who we took to be a local student, was sat playing an acoustic guitar at a front pew, adding to the serene ambience. 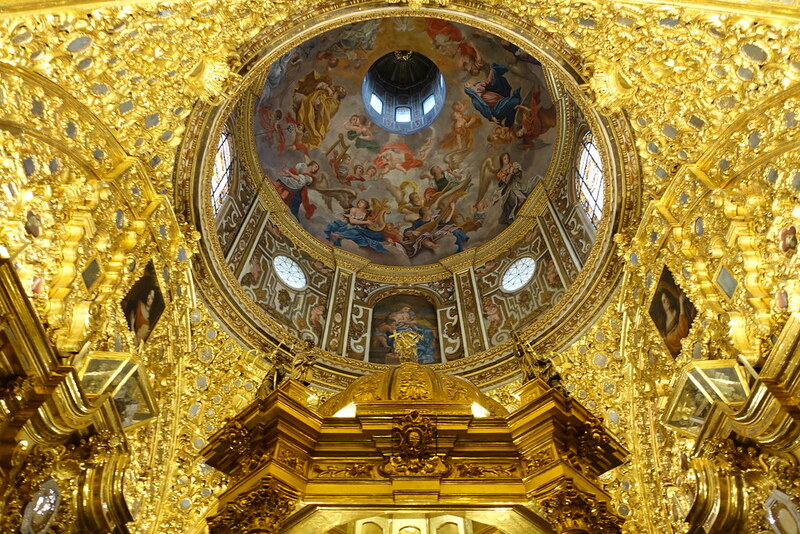 Visiting the Basilica of San Juan de Dios is a much more formal experience, but with good reason. After paying the €4 entrance fee you’re handed an audio guide to take you around the building, which gets more and more spectacular the further you venture in. 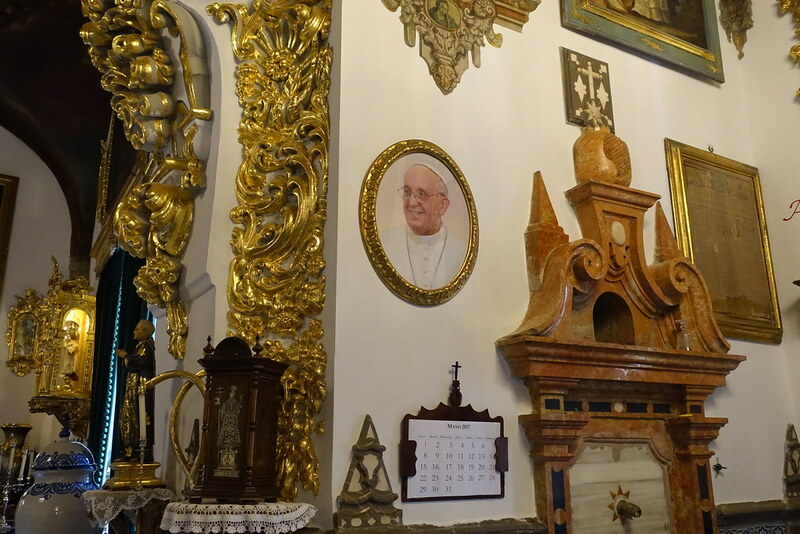 You begin in the extravagantly furnished rectory, where we couldn’t help giggling at the lovingly framed photo of Pope Francis. 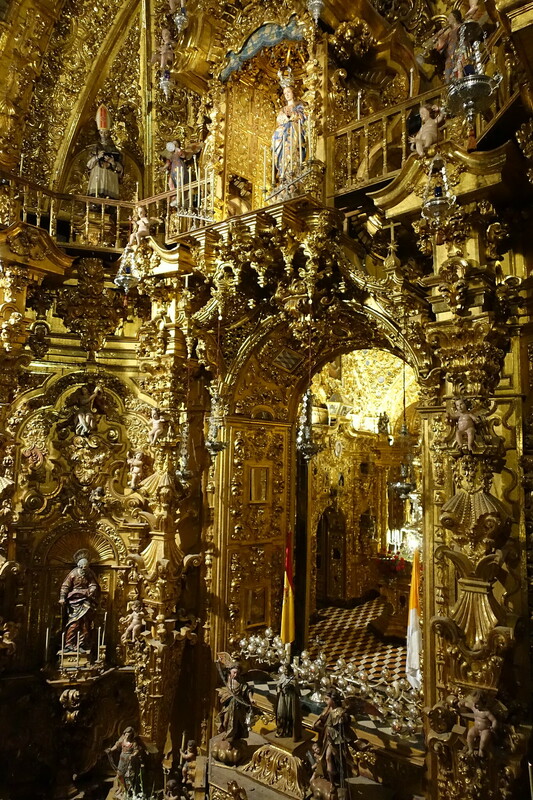 This does little to prepare you for the main church, which is completely, startlingly resplendent, in floor-to-ceiling gold. 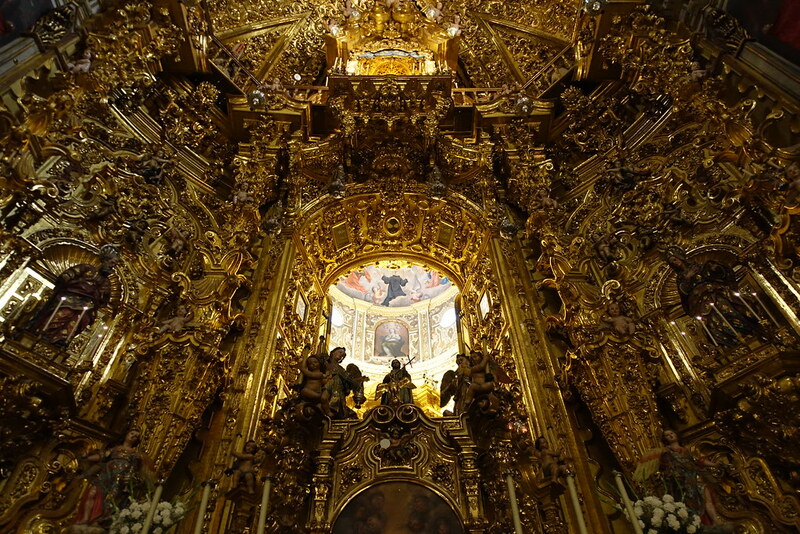 The walls are filled with elaborate and intricate carvings and figures, too many to take in. 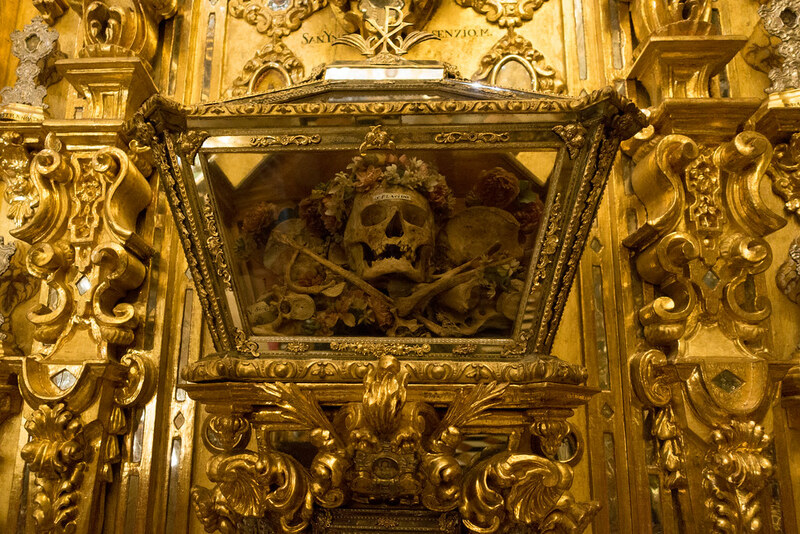 And then an attendant opens a door that lets you into the upper galleries, which, among more opulence, contain macabre displays of the skulls and bones of dead holy men. It’s an unsettling combination of grandeur and ghastliness that’s quite unique to see. Wandering next to the Monastery of San Jeronimo, we found the doors to the monastery itself shut but those to its large courtyard open, by just a crack. Peering in, we saw a raised stage in front of many lines of plastic seats. Posters arranged around the place suggested there was going to be a free concert taking place, so we sat down to wait. Eventually, an orchestra crowded onto the stage and our patience was rewarded with some stunning live music. We only managed to stay for a few songs before our stomachs demanded we go and find dinner. 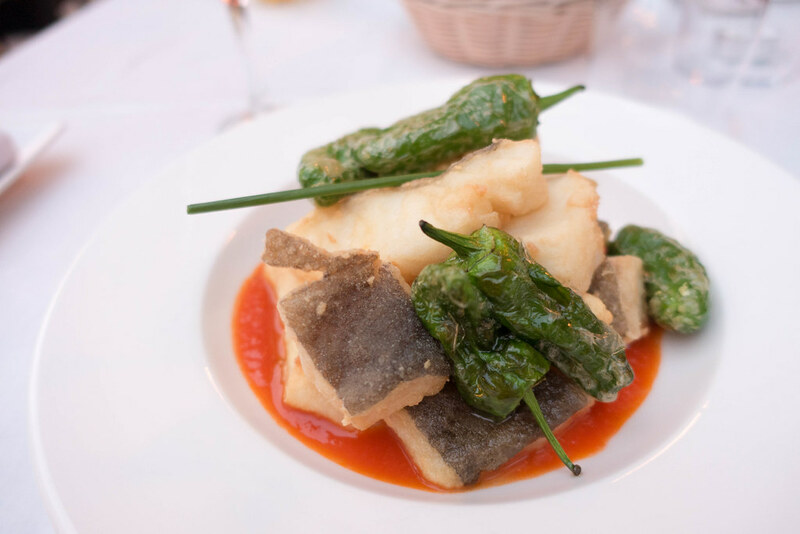 On our first night in Granada we had dinner at Romanilla 530, a restaurant near Granada Cathedral and in the same square as Alhambra Churreria. 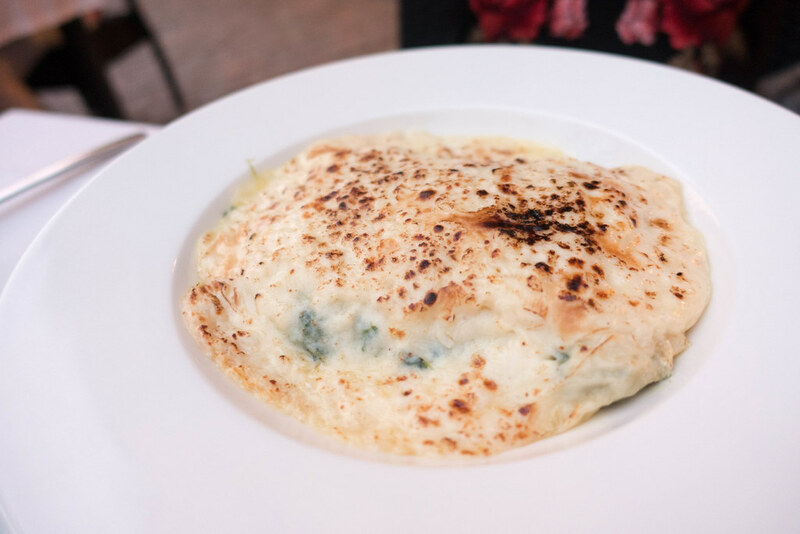 We were impressed by the large choice of dishes offered, which ranged from local dishes to twists on international favourites. Starting with a lovely Lambrusco wine (lower alcohol, fizzy red wine), followed by a local white, I had the most delicately fried cod with tomato sauce and green peppers, while Tama had a vegetarian lasagne with spinach, raisins and pine nuts. 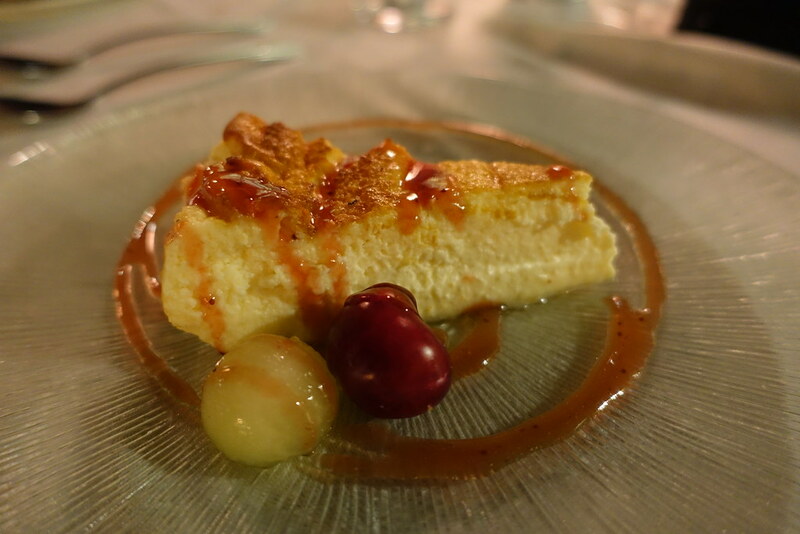 These were followed by delicious cheesecake and crème brulee. Sat at a table in the outside square, we soaked up the relaxed, buzzy ambience as the light faded and the air cooled. On our second night in Granada, and the final night of our holiday, we sought dinner close to Mirador San Nicolas where we planned to view the Alhambra lit up once night fell. The restaurants closest to the square were inevitably expensive and (it appeared) fully booked, but by walking just a bit further down the hill we found a lovely restaurant called El Trillo. 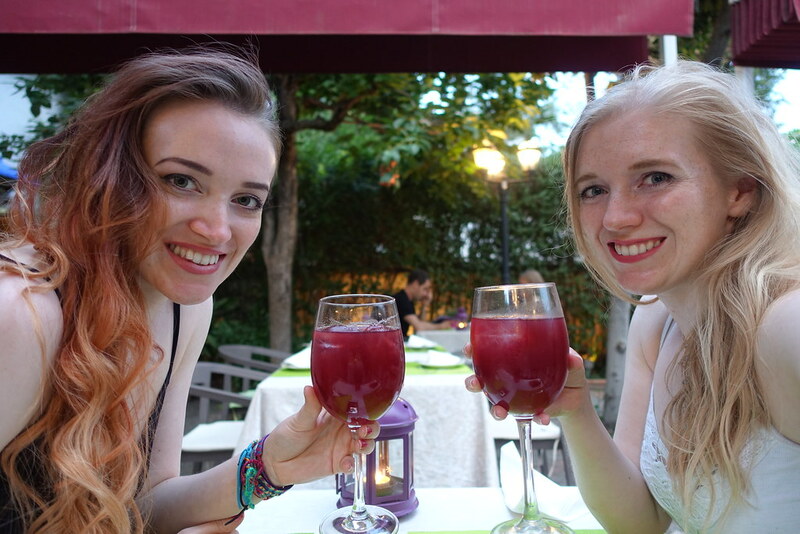 As we hadn’t prebooked, we couldn’t snag a table on the raised terrace from which you could see the Alhambra. Instead we were seated in the centre of the beautiful garden, surrounded by trailing flowers and leaves. 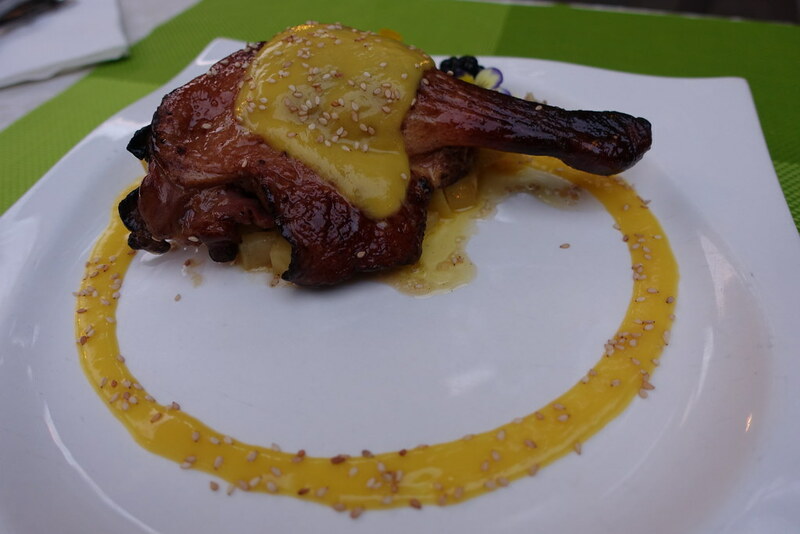 The menu is fusion-like, offering unique twists on both local and international dishes. 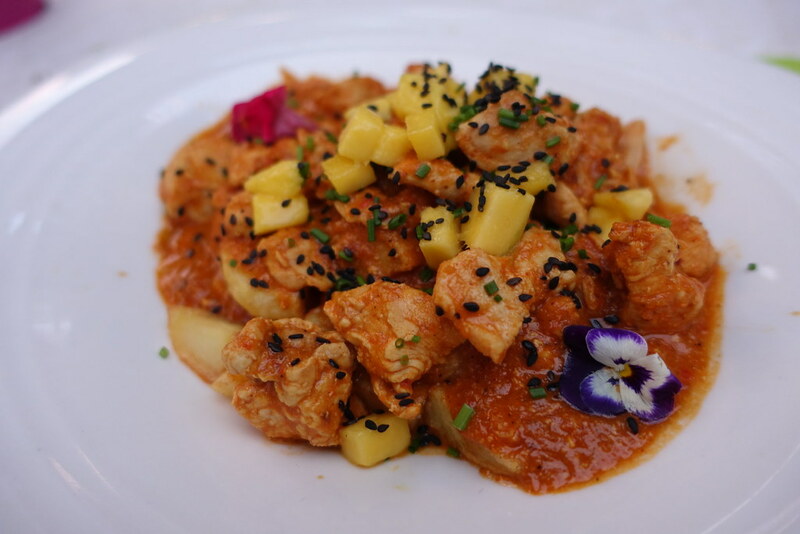 I ordered a fruity chicken curry sprinkled with sesame seeds, while Tama had confit duck leg – both came garnished with real fresh flowers. 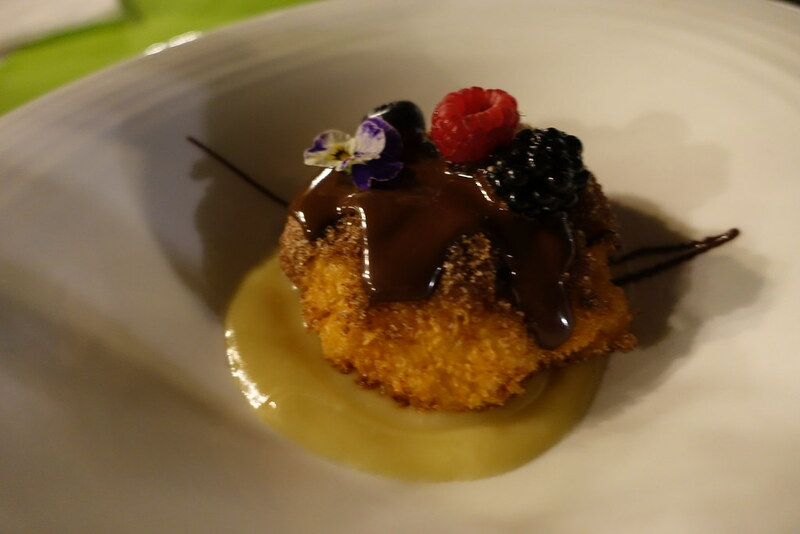 My favourite part was dessert, for which I had the Spanish delicacy of Leche Frita: a bread-crumbed and deep-fried dumpling of sweet condensed milk, topped with hot chocolate sauce. 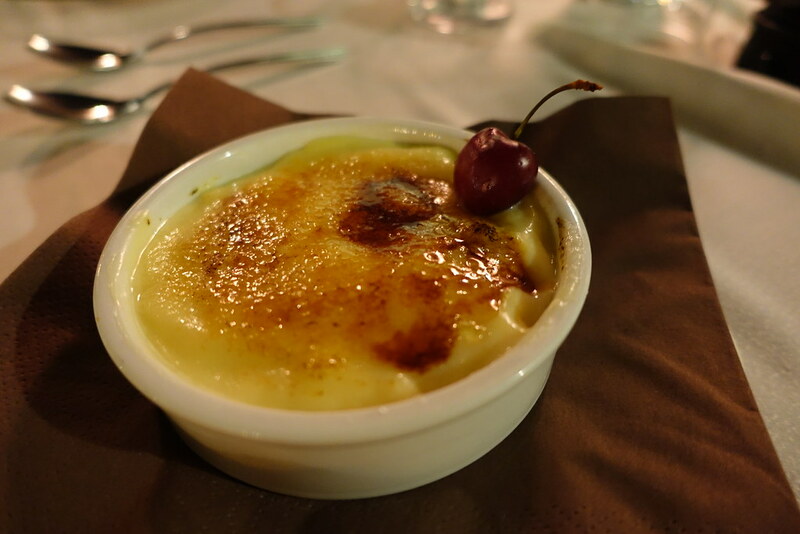 The service was excellent – our young, friendly waiter veered just on the right side of flirtatiousness! We stuffed ourselves to the brim and, as the sun went down, toasted to the end of a wonderful holiday with more glasses of tinto de verano. You can find all of my blog posts about Spain here. 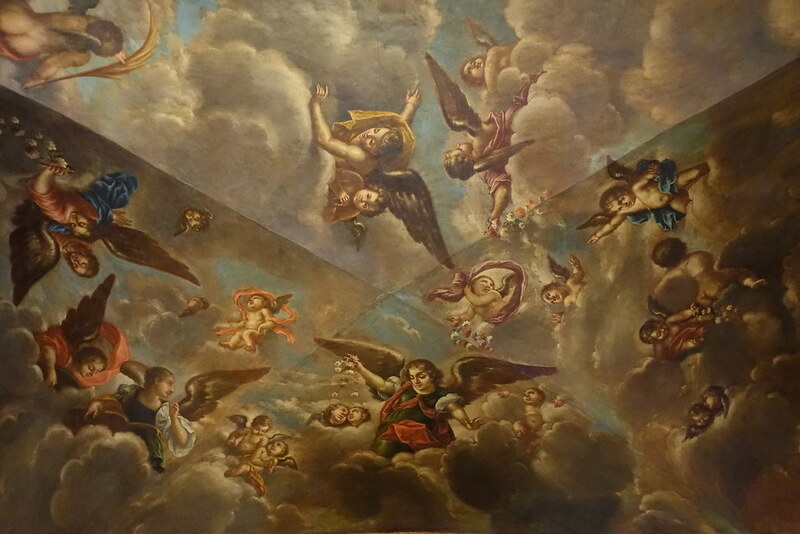 Posted in Photography, Reviews, Spain, Travel, Western EuropeTagged Alhambra churreria, cathedral, churros, El Trillo, Granada, Romanilla 530Bookmark the permalink.